How does a community handle disruptive change? Does it adapt by integrating old and new? Or does it hold fast to the past? The municipality of Saaba in the African nation of Burkina Faso faced this choice in 2016. The population of Saaba had doubled from 50,000 to approximately 100,000 residents in only ten years. This rapid expansion had challenged the customs of a once close-knit community. Long-time residents were outnumbered by unknown newcomers, many of whom came to and from the capitol at all hours. Lacking resources to absorb these new residents, Saaba was struggling. Formerly strong neighborhood bonds had weakened, spurring land disputes, burglaries, and violent crime. Saaba’s police force—whose resources had not kept pace with the increased number of residents—was overwhelmed. With so much in flux, people feared for the future. After ten women were murdered in 2016, seemingly without a decisive response from police, a group of women occupied the gendarmerie in protest, demanding that the suspect in custody be released to them for punishment. That suspect was attacked, but according to security officials, the women may have punished the wrong person. Frustration with the slow pace of justice had led, in some people’s view, to more injustice. 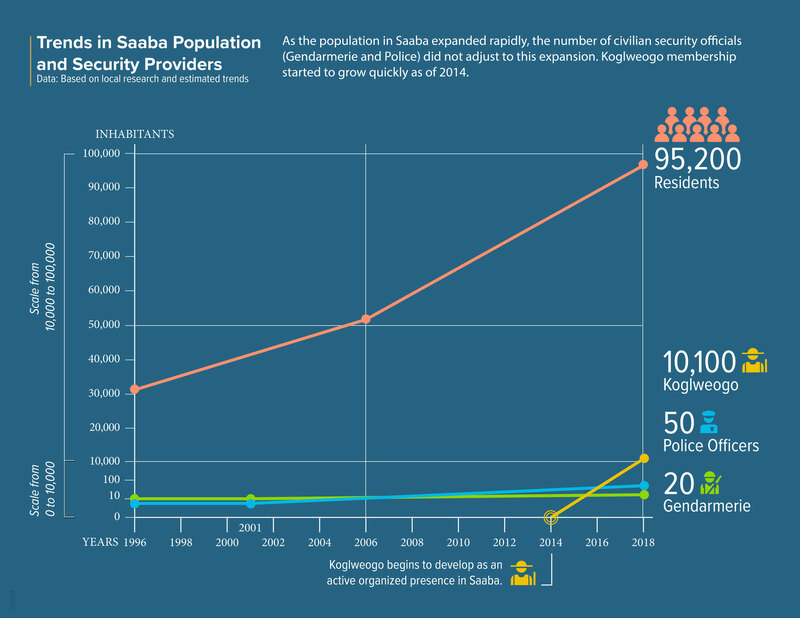 As the community sought to respond to these and other crimes, factions evolved, with security forces on one side and an unofficial public safety group called the Koglweogo on the other. Many people appreciated the Koglweogo for their swift reactions to crime, but others worried that the Koglweogo’s sometimes violent methods prevented due process and further alienated police and citizens from each other. The situation was at an impasse. Fortunately, Saaba also had leaders—some official, some informal—who wanted to find a new way forward. Residents knew the dangers of broken community connections. In January 2016 an Al-Qaeda attack in Ouagadougou had underscored just how violence could erupt in places where people did not know or trust each other. Determined to reclaim Saaba's future, residents, religious leaders, and local officials joined with USIP to explore a new response to change. In a series of Justice and Security Dialogues (JSD) in the fall and winter of 2016, Saaba residents and local leaders met to face these hard issues together. USIP supported participants as they customized the process to align with their own traditions. The work of Saaba’s Chief and his protocol reflects this mix of old and new. The Chief’s role as a mediator has become a recognized part of the divisional court system. When these courts are shuttered due to lack of funds, the chief and his protocols continue their work, but they do so unofficially. However, newcomers to Saaba are unlikely to know the chief and may be unaware that he and his team can be a resource. Such residents can go to the police, but the backlog of cases would likely prevent quick resolution of their problems. The lack of options in this realm highlights the need for coordination among security departments. Tackling these kinds of challenges is central to the JSD process. The JSD results have been promising; participants have begun three specific projects to rebuild community relationships. Students and homeowners have reported better accord with the police and more willingness to report crimes through official channels. Vigilantism is ceding to collaboration with official security forces, as all parties have grown more aware of how they can most productively work together. The road forward was not easy. Previous adversaries, such as the Koglweogo and the police, have had to experiment with untested partnerships. And given how the two groups viewed each other at the outset, partners seemed like the last things they would ever be. At first they couldn't stand to be in the same room together. 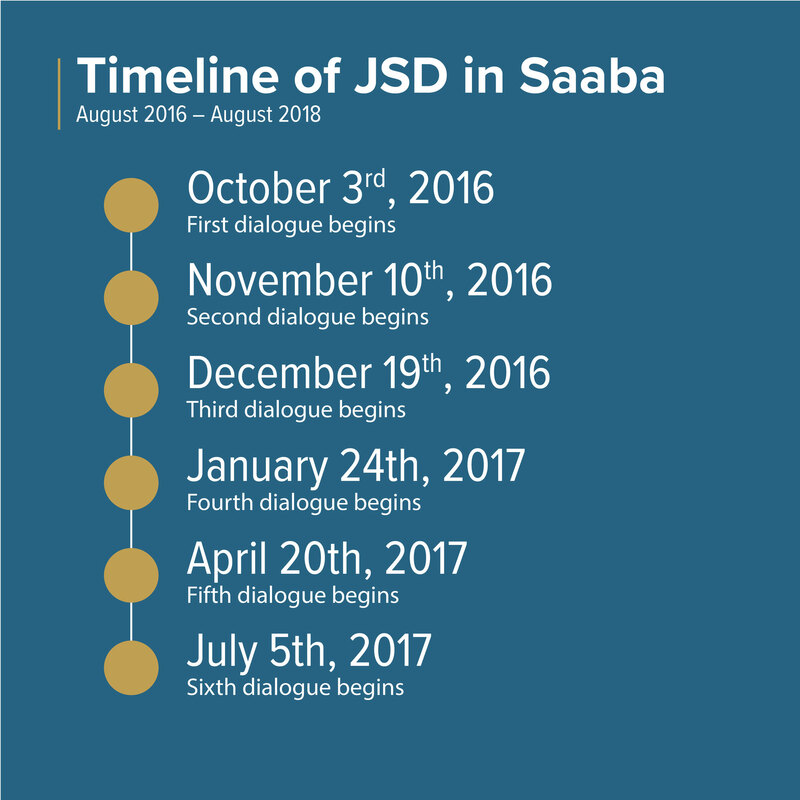 At a preliminary Justice and Security Dialogue (JSD) in January 2016, Saaba’s Koglweogo members became angry after hearing what they perceived as critical comments from police. Speaking for his group, a 90-year-old Koglweogo elder made an announcement: “Those who don't want the Koglweogo are free to go to Senegal, Mali, or Ghana. But the Koglweogo will always exist in Burkina Faso.” Then the elder and his cohort stood and left the building. With that, the JSD process in Saaba could have ended before it had begun, if not for the facilitators’ skilled interventions. For example, USIP’s country officer, who had taken particular care to welcome and care for the Koglweogo elder at earlier JSD gatherings, met with him later that day. She assured him that his group was vital to the success of the discussions, and that the Koglweogo would be respected at future meetings. The Koglweogo members returned to the table the next morning and never left. Not all of the group’s conflicts were so smoothly resolved. People in Saaba were understandably outraged by high levels of crime. From the Koglweogo’s perspective therefore, punishing criminals was a public service, not a problem. Security officers, on the other hand, were frustrated by the Koglweogo’s self-appointed role as guardians of public safety. For police and gendarme officers, the Koglweogo’s vigilantism made their jobs even harder. Finding common ground required both sides to release entrenched positions and find new standpoints. JSD discussions allowed space and structure for this exchange to occur. Once the police heard how their sometimes poor treatment of residents deterred public cooperation, officers pledged to receive training and improve their behavior and procedures. Once the Koglweogo understood just how constrained the police were by shortages and regulations, they stopped expecting crimes to be solved overnight and began looking for ways to support the justice system. Better understanding took time, but it prepared the way for innovative action. Today, the rigid crime fighting factions of a few years ago have softened. Police now rely on the Koglweogo's help to solve crimes and keep order during protests and other public emergencies. Saaba's Koglweogo members have also been willing to stop exacting vigilante justice and instead bring suspects directly to the police, without physical altercations. This level of rapprochement between police and the Koglweogo is unusual outside of Saaba, and it can be traced to the trust engendered by the JSD process. From the beginning, the divisions between police and the Koglweogo belied the many things they had in common. The majority of people in both groups wanted a better quality of life for Saaba’s residents, supported by more efficient policing. The challenge was to create a path to achieve these goals. The police and the Koglweogo are finding that shared values and relationships can be a sound basis on which to build an evolving collaboration.Others in Saaba share the same outlook and work every day to make it manifest. While they may not be fighting crime directly each day, their work has a direct bearing on how people experience justice and security. And listen they did. Pauline Nama, another JSD participant, explained why putting women first was essential. Women were often the primary victims of crime, she explained, as well as the primary educators of children. Whether one looked at root causes or direct effects, Pauline said, addressing crime in Saaba’s meant making women’s security a priority. My role is to bring a smile to children in difficult situations, to vulnerable women, women who have found themselves in really tough situations. These official roles complement her ongoing work as an advocate for women and children. When children’s families are caught up in violence, Pauline serves as an intermediary between families and the gendarmerie. Her supporters range from Saaba's mayor, who recently awarded her a medal; to local businesses and pastors; to the U.S. State Department, which has made her a candidate for an International Women of courage award. Residents of Saaba represent a variety of religious affiliations: Muslim, Protestant, Catholic, and animist, to name a few. These religions exert a profound influence in Saaba, and religious leaders are at the forefront of Saaba’s response to recent changes. Whether by conducting large, public prayers or by guiding individual families, these leaders shape the community’s work toward peace. Tolerance among adherents of different religions was discussed at JSD gatherings. Since, as one person put it, “robbery doesn’t choose a religion,” participants acknowledged that despite their religious differences they were facing a common problem. In this way, a discussion about reducing crime spurred residents to acknowledge the basic needs they shared. This, in turn, opened up space for new avenues of cooperation. Crime waves capture attention, as they should. But underneath people’s extreme experiences of violence, the heartbeat of life in Saaba goes on, maintained by families, students, religious leaders, public servants, and others. Bringing all of these voices to the table through the JSD allowed for rich exchanges of ideas—sometimes combative, sometimes conciliatory, consistently geared to problem solving. Because the meetings drew from different threads of life in Saaba, the solutions the group endorsed are both groundbreaking and in tune with local traditions. For some people, the word “dialogue” suggests a rambling discussion that achieves little. In Saaba, however, the Justice and Security Dialogues (JSD) are anything but aimless. Difficult issues are rigorously examined, sometimes to the palpable discomfort of participants. People have to re-examine old behaviors and consider new responses. But this work generates rewards as well. Unforeseen partnerships lead to ideas and energy that no one had expected, as people begin to think about justice and security in different ways. Again and again the dialogues affirm a central truth: strong relationships among residents are the key to public safety. During the dialogues in 2016, JSD participants grappled with the ways recent growth had put stress on local neighborhoods. Options for rebuilding community connections were also explored. Participants found that the most durable alternatives were based on and respectful of cherished customs. Today, the JSD process goes on in Saaba, as people gradually build peace from the inside out. The positive results gained in Saaba reflect what community driven security building can accomplish. For this reason, Saaba’s JSD experience can inform wider deliberations about public safety. As extremist attacks in the Sahel region continue to occur, governments are considering new ways of reducing violence, including methods like the JSD that do not involve military measures. Lessons learned in Saaba are being used at the national level. For example, in 2017, after the JSD process had brought together Saaba’s police and Koglweogo group, state officials offered to make the national Koglweogo board an official part of Burkina Faso’s security forces. The board refused this offer, but they did agree to government mentoring and some level of supervision, while emphasizing their desire for more efficient community policing at the local level. In another encouraging sign, the national Koglweogo board attended a government security forum in October 2017. The seeds for these and other positive steps were sown in Saaba, where people took a chance on dialogue and found new directions for peace. The “Sensitization” project involves increasing awareness of both local officials and residents. To this end, theater productions, always popular in Saaba, are being held in each of Saaba’s 26 villages. Follow-up discussions allow spectators to speak with the mayor and other local officials about the causes of crime as well as the officials’ plans for public safety. The events are popular, with up to 300 people attending each performance. As officials and residents exchange ideas, they use a traditional setting—the theater—to affirm a new expression of democracy. Local crime watch groups began operating in the fall of 2017. Residents are working closely with police forces to create teams in neighborhoods that can spot, report on, and deter crime. The efforts have already exposed a ring of criminals posing as police officers and demanding bribes. The early success of this venture is encouraging public participation and cooperation with the police. Community driven police training, so as to improve relations with residents and increase options for partnerships. *The Saaba docuseries will be broadcasted by PBS World Channel’s “DocWorld” in the upcoming months of 2019.